Tauribot is a scam - Review with Proofs! Tauribot is a scam – Review with Proofs! Tauribot by Dr. Steven Archer is said to be a revolutionary trading software sponsored by Chicago University. Don’t be fooled though, as Tauribot is a scam. Find out the truth behind the scam in our in-depth Tauribot review. To be honest, even after reviewing close to a hundred binary trading software scams, the presentation of Tauribot scam impressed me. It looks professional and highly credible. But still, a scam is a scam. Tauribot uses a different approach of promoting their software – through the authority of an alleged Professor of Economics, Dr. Steven Archer backed by the reputation of Chicago University. 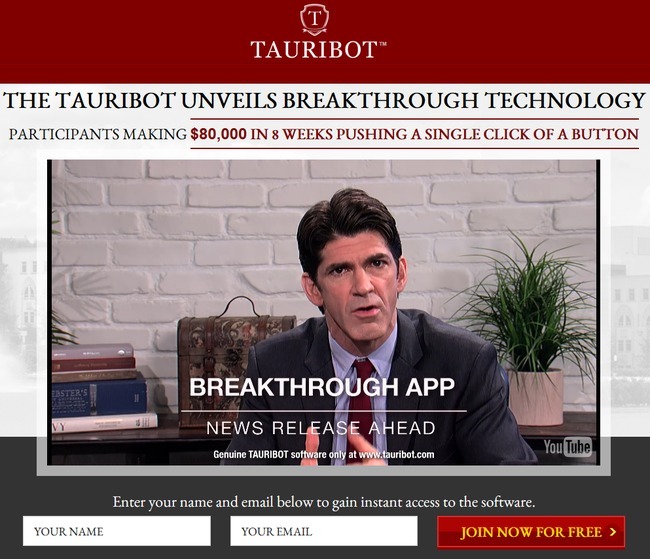 As convincing as the sales video sounds, there are inevitably some red flags and hiccups that expose Tauribot scam. And we are here to lay out the proofs and help you avoid the scam. Of course, the scammers behind Tauribot scam understands the legal complications of using the real logo of a university that doesn’t have anything to do with the scam. Therefore, like many other scams (such as Citidel), Tauribot scam changed the name and logo of the university to avoid legal issues, and at the same time leveraging on the authority and reputation of this institute. Did you realize that Dr. Steven Archer and everyone else in Tauribot scam video refers to the university as Chicago University? In reality, there is no Chicago University. There is only University of Chicago, and it is not involved in the scam at all. Nothing in the sales video of Tauribot scam is real. Sometimes the truth can only be found by digging deep into the scam. The full risk disclosure statement can only be found in the members page of Tauribot scam at http://tauribot.com/members/. The document is linked by an extremely small fine print that says “user disclaimer” at the very bottom of the page. It’s not even found in the homepage of the scam. The Tauribot sales video is fictitious and was produced to portray the potential of the Tauribot 3rd party signals software. Actors have been used to present this opportunity and it should be viewed for entertainment purpose. We do not guarantee income or success, and example results in the video and anywhere else on this website do not represent an indication of future success or earnings. Everything presented in the sales video is fake. All the results shown in the video are to portray the POTENTIAL of the software. The results are not even real! Everyone that appears in the sales video are actors and actresses. That means there’s no Dr. Steven Archer (we’ve verified through University of Chicago staff directory), no Ian Tauraski, and no Patricia Johnson. Worst of all, Tauribot scam suggests that you should only view the video for entertainment purpose! Despite giving you multiple promises to make huge profits through Tauribot software, now they deny any guarantee on income and success with their software. These facts alone should be enough to steer you away from the scam. How can you trust a product that doesn’t even show real results in their sales materials? Let alone using actors and fake member testimonials to deceive you. These terms and conditions are not here to give you a fair warning as a consumer. The sole purpose of this document is to protect the scammers from legal actions when you lose all your money trading with their software. You can’t take any legal actions because you it’s been stated in the disclaimer that Tauribot scam does not guarantee any income or success with their software. If they wanted to be honest about the risks of using the software, and the fact that all results shown are not real, they would’ve told you in the sales materials. Instead, they chose to present you with lies and fake promises, and go to great lengths to hide the truth. Why Are People Writing Good Reviews for This Scam? By now, I hope you are convinced that Tauribot is a scam. I realize that there are a lot of positive reviews for this scam on the internet. Even the more reputable binary software review sites are giving raving reviews for Tauribot scam. Sadly, in some cases, the reviewers are swayed by the commissions and choose to endorse scams. As an internet marketer, it’s inevitable that I endorse products as well, but I choose to recommend only products that genuinely help people. I could’ve written a raving review for Tauribot scam and encouraged my readers to sign up, and I’ll earn a nice $250 commission once they deposit into their trading accounts. In fact, it’s a lot easier to write than to look for evidences and to expose this scam. However, I’ve been a victim of binary software scam before and I don’t want my readers to end up the same. 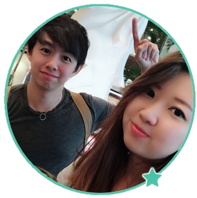 If you really want to make money online, I’ll only recommend legitimate business opportunity that I personally benefit from. Tauribot scam, along with Citidel and Virtnext are some the more successful binary software scams out there because they have managed to generate a lot of fake reviews and deceive their potential victims. YES, TAURIBOT IS A SCAM. If you decide to sign up with Tauribot, you’ll be required to open a binary options trading account and make a deposit before the software can start trading for you. You will end up losing all your money by trading in extremely risky investments. If you have some cash to spare for entertainment, you may go ahead and try it out. But you’ll be better off spending it on a nice dinner with your loved ones. Zulander Hack is a Scam – Review with Proofs! Social Tech Trader is a Scam – Review with Proofs!